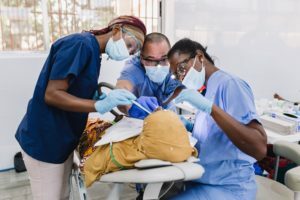 GARDEN VALLEY, TEXAS (ANS) — Minnesota dentist Dr. David Ugai leads Mercy Ships’ dental team in Guinea, West Africa, teaching 13 dentists and 41 dental students while also providing care to nearly 6,000 patients. Dr. Ugai heads up the Mercy Ships Medical Capacity Building (MCB) program in dentistry which aims to enhance the standards of care within African partner healthcare institutions. On World Oral Health Day (March 20), Mercy Ships recognized Dr. Ugai, a volunteer from Woodbury, Minnesota, for his commitment and dedication to the oral health of patients in Africa. Ugai is currently working in Guinea, West Africa with a team of 13 volunteers from the Africa Mercy, the world’s largest private hospital ship. Through a partnership with the Guinean Ministry of Health and Public Hygiene, the facilities, areas and persons for capacity-building projects were identified. The MCB program includes mentoring and courses taught to faculty and students at the Gamal Abdel Nasser University, the only dental school in Guinea. Ugai and his team have treated nearly 6,000 dental patients since the Africa Mercy arrived in Guinea in August, 2018 in a free clinic available to citizens. Additionally, they are mentoring and training Guinean dentists and dental students via the MCB dental program. This training contains practical and relevant medical capacity-building projects that demonstrate and impart knowledge, skills, and a compassionate, professional attitude to each participant. “Working with the dentists and dental students from Gamal Abdel Nasser University has been a mutually beneficial learning project. The dentists and students are very equipped and motivated to provide excellent care for their patients,” Dr. Ugai told ASSIST News Service (www.assistnews.net ). “Mercy Ships has been able to provide some additional advanced training and clinical skills not available within the limited resources of the university. It has been a privilege and honor to work alongside these very skilled professionals,” Dr. Ugai said. After the field service ends this coming June, Mercy Ships will hand over a fully-renovated, equipped and fully-functioning dental clinic to the university. It is designed to meet the training needs of Gamal’s dental students, ensuring future generations of Guinean dentists are properly equipped to enter into the local dental workforce and provide quality care to patients. Mercy Ships has volunteer opportunities for dental professionals including hygienists and assistants. Please see www.mercyships.org/volunteer for more information.